Lets start with characters since that was addressed by someone else earlier. 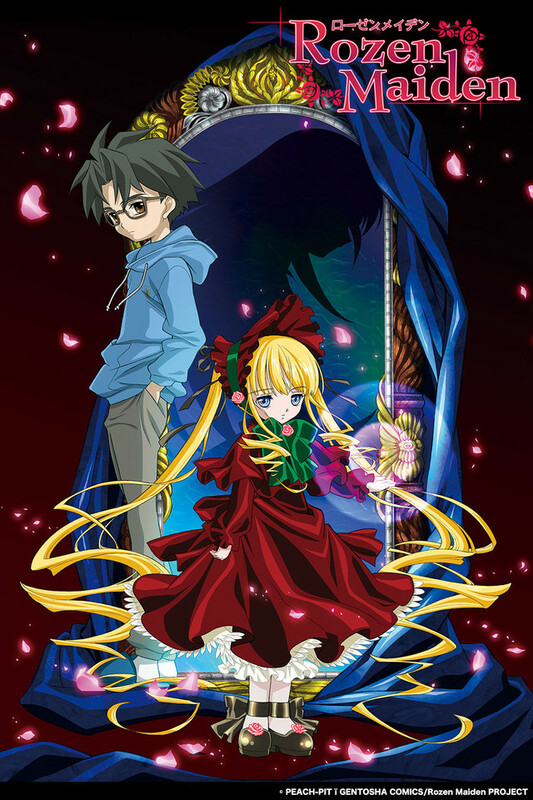 All of the characters in the Original Rozen anime developed themselves the way the needed to be developed and went a step further with Shinku and Suigintou in addition to others. Shinku learned to end playing a "false game" on principle, Suigintou began to see the value in others including her sisters, Suiseiseki started acting like gave a damn and less like a deviant victim, Hina Ichigo grew up a little and that was to name a few. The fact that Kirakishou was at the very end was one part of showing the animators vision for this anime was not complete and need to be (one reason my RMZ angered so many). But the biggest character development that was well done was the one that "Said Critic" found to an "awful male lead". Jun made the most believable transformation in character development. But I will concede that his voice did get annoying in both the Japanese and English version come end of season one. Jun was supposed to start off whiny and pathetic, and ever since meeting Shinku was set on a path of growing up. In season two he was no longer running timid and bitchy, though he still had fits of indecisive whiny tendencies there were fewer and far between. And that was the point you don't grow out the crap attitude rut that Jun was at the flip of a switch the process is slow and needs support from people who don't give up on you. I think if they did a proper season three we would have seen a much stronger character in Jun as intended. And I would have hoped they'd have made his voice more grown up too cause also would have been believable and admit tingly less annoying. On one hand these characters were tacked on the other to the Z's credit they were developed from the point in the manga the anime decided to cover. but I think was also part of the problem cause the manga had story holes too. The other development hole that afflicted all the characters was the fact that Zuruckspulen didn't start from the beginning. It was designed to lull in the fans of the original anime and put this one over on them. So it didn't start from the beginning. And since the dolls didn't get much face time they really didn't change much from where they changed previous in the manga, and since Zurukspulen focused more on the manga that's something that reflects heavily upon the manga. Most of all since Zuruckspulen decided to revolve completely around Jun rather than Shinku and the dolls this created a world of problems. Adult Jun's character was static and dismally refusing to change up until the last 1 or 2 episodes with him here he suddenly does a complete personality "one-eighty" overnight (they flipped the switch). Adult Jun had one thing going for him his voice wasn't annoying, but he was annoying! Not as whiny but somehow twice as emo with endless mundane "my sad poor life". Alot of critics are wrong that Adult Jun isn't believable he is believable and real but not in a good way nor a relatable way let alone a respectable way. And it certainly didn't make you ever want to care about his character at all. A bland annoying pushover that to quote Alucard (Hellsing) "is incompetent and incapable of acting on his own". Adult Jun from start to his empty headed end was about as interesting as a wet dirty dish rag and nor much brighter either. The whole time I to put Adult Jun out of his unentertaining blah misery and throw him from speeding air plane at 30,000 feet! Then at the end he somehow flips the switch and makes all the stars in his wasted life somehow magically align with a big but still bland smile. People don't change that radically over night and his character never developed to a point that could make that kind of leap like that especially all on his own. Epiphanies are one thing but even they take time truly alter someone completely, apply this to Zuruckspulen show what took place in the time span of I think less than a month. The biggest reason why I never faulted Charles Dickens for having Ebeneezer Scrooge "flip the switch" inside of a night was because the time Xmas Carol was written in and the length of the story. Zuruckspulen had NO excuse for this show had 13 episodes get those character design and character development wheels moving and they didn't. Rozen Maiden the proper anime much to the anger of critics and weeaboos didn't use the drawn animations from manga. This on the other hand was animators went completely right. They knew it was an old dead style and draw that worked on a manga scale but wasn't going to sell on the anime stage. So they revamped the animations and character drawn imagery. Mangas are always rough drafts of a great idea if they're good. They made character draws and styles that where not only up to date but made the dolls adorable! These girls all collectively stole the hearts of anime and scifi fans every where regardless of their prefured style, genre even gender. Not bad for a chick flick anime. pandered to the minority and made everything as antiquated as the manga rendering everything badly, hilariously crap drawn. It ruined the adorableness of the dolls that stole everyone's hearts. It was an un epic display of blah that looked like something closer to a cartoon than something as prestigious as an anime.... Shinku Suigintou and Kirakishou especially were all visually lacking in facial detail and any at all loveliness of the old. Well Z had issues of its own. If Suigintou was incomplete but still able to come to life and get her own roza mystica how is it that Kirakishou, a doll that never was somehow come to life and come to life with a roza mystica already in her???? How did Kirakishou gobble up Hina and then some how steal Souseiseki's body? If Adult Jun was so set being the product of his shut in past how did he even survive adult hood? He should be dead in the streets. Was Suigintou repaired in Z as she was in the second season of the Original? AND WHY DID HEY LOLLI HINA IN THE OPENING? One of the greatest titles in the history of anime is right here with the cult success, beautifully drawn animations and touching story. Rozen maiden easily won the hearts and minds of die hard anime freaks everywhere. And everyone was bummed when it only lasted two seasons. but now everyone that counts has thrown their hands up in the air in disgust or simple lame gesture now that doesn't have a proper continuation but rather a terribly and terrifying reboot in RM Zuruckspulen. Where did something so right go so wrong? The bigger problem as I keep pointing out in previous reviews is Weeboos. As also pointed out by one of the greatest anime legends to grace the art Hayao Miyazaki. He's continued to warn that the industry is being ruled by Weeboos, a minority among the anime community and an even smaller group when you count all of Sci-Fi. He warned that they would cause the downfall of the community especially now that the anime industry is now depending on the U.S. and Europe in addition to Japan. Weeboos thrive on mediocrity and a static unchanging view of anime. And they're a complete double standard! They praise the horrible animations and sleepy story while trashing and trying to stop animes like RWBY claiming they are badly animated and written and because it's "American" (thats border lined racist). and to make matters worse at least half of them are a filthy pack of closet lolli pedophiles. difference is they keep improving RWBY's story and animations. but with Rozen Maiden they completely sabotaged all the great things this anime accomplished going from great animations and story to a crappy one in Zuruckspulen. The Weeboo community claims to have these rigid standards but seem to act on none at all! all of their opinions are based on no principles at all but rather on a whim! Truth is the Rozen Maiden Franchise is still worthy of being one of the greatest franchises in anime history but it must continue to keep improving and evolving like many of the other classics (like Bleach, Hellsing and RWBY) that either still going or updated with newer more fluent story and visuals. and for something made back 2007 this anime has all that unlike its replacement. I had been meaning to watch this show forever! Sadly, as most animes in my life - I just never had the time to find it and watch it. So when I saw CrunchyRoll had it, I knew I had to watch it. The art is amazing, the story is captivating. There are so many emotions that you experience watching this anime. I've laughed and cried, and so much more. I had a hard time stopping watching this one! I had a few nights where I didn't get much sleep because I couldn't stop. Got me into anime long ago. I remembered me always wanting me one of those little maidens. Oh those were the good ol' days.